You’re probably here because you’re fed up and tired of pain affecting your life. It might be stopping you working or enjoying family time. It might be stopping you exercising, or playing sport. In short your pain is stopping you enjoying life as much as you could, and you don’t feel like yourself. Get yourself back on track and in control again here. Start moving and living better now. Your little one is the most important person in the world. You may be here because you want safe gentle treatment from a trusted practitioner. Treatment could help soothe and relax your baby, or help your child recover from joint and muscle pain. Thorough consultation, examination and treatment from a qualified paediatric osteopath with extensive training and experience. Your pregnancy and postnatal time is very special, and you want to enjoy it. But you might be here as you may have aches and pains affecting your daily life. Get gentle, safe, tailored treatment here, to help you at this special time. I've helped lots of pregnant and postnatal mums over the years, and use this experience together with my postgraduate training to help you. You may be here because you’ve had enough of pain and stiffness affecting your life, and you're searching for a way forward. Your pain maybe making you stressed and tired because you can’t get on with your daily activities and hobbies easily. You might be worried because pain is affecting your work, or ability to run the house, or look after your family. You simply want to get back to feeling like you used to. You've come to the right place … My mission is to help and work together with you, to get you moving better again. I don’t want to just fix your immediate problem. I’ll also give you advice on how to stay fit and healthy for your future too. I have helped hundreds of people just like you and your family, and am very excited to work with you! When can we book appointments? I run a professional, happy and welcoming clinic. All I want is for you to able to relax and feel comfortable while I listen to what you need help with. All treatments are tailored specifically to you, ensuring that you are restored to optimal health quickly without it costing more than it should. My priority with any patient is to find the best course of action for you. I will refer you to other health professionals if I am not the right person for your problem. Most adults need between 3 and 6 sessions (one session per week) usually on a weekly basis. I will space your treatment sessions further apart as quickly as possible so you don’t spend money unnecessarily. Each person is different and I will discuss with you your realistic recovery time. A long term problem may require more sessions. Sometimes people like to have a treatment every so often as ‘maintenance’ to reduce their likelihood of problems. Can I Bring A Friend/Partner? You are more than welcome to bring a chaperone with you to any of your appointments. Please be aware that of course they will then hear what we are discussing, which includes your medical history. It is not compulsory for you to undress, and you are welcome to wear shorts/leggings/vest top. There is also a modesty gown you can use as well. However please be aware that osteopathic diagnosis is partly based on observing how your body moves, and it’s usual when seeing an osteopath to be asked to remove clothing from the area being treated. If you are uncomfortable with this, then just let me know and we can work around it. Osteopathic treatment is generally gentle, but some techniques for example stretching and articulation of tender joints may be uncomfortable and I will warn you of this, but just let me know if you would prefer a different technique to be used. 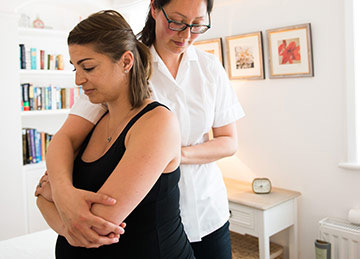 I use both ‘structural osteopathy’ which involves moving and stretching your joints, and working through your muscles with massage, but I also use ‘cranial osteopathy’ where I gently place my hands on the area of your body being treated. Cranial osteopathy is very gentle and relaxing. Often people can’t feel much when being treated cranially but notice the improvements in their symptoms and a common comment at the next session is “I feel better but you didn’t seem to do anything! What Training Do Osteopaths Have And Are They Safe? To be a registered osteopath in the UK you have to complete 4 years full time study to qualify as an osteopath. It’s so extensive because you cover a lot of medical science such as anatomy, neurology, physiology and pathology. You also train in specific clinics such as paediatrics, sports injuries and pregnancy. 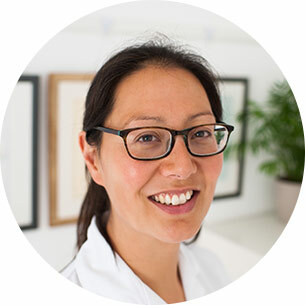 To be a registered osteopath with the regulatory body in the UK (the General Osteopathic Council) you have to complete at least 30 hours of continuing professional development each year to ensure your knowledge and skills are up to date. I am a registered osteopath and my registration number is 7470. © 2019 Aimée Cox Osteopathy.